(Nanowerk News) A team of scientists at the Max Planck Institute for Polymer Research (MPI-P) discovered that electrical conduction in graphene on the picosecond timescale - a picosecond being one thousandth of one billionth of a second - is governed by the same basic laws that describe the thermal properties of gases. 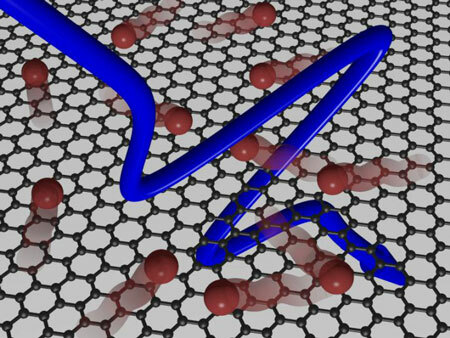 This much simpler thermodynamic approach to the electrical conduction in graphene will allow scientists and engineers not only to better understand but also to improve the performance of graphene-based nanoelectronic devices. The researchers found that the energy of ultrafast electrical currents passing through graphene is very efficiently converted into electron heat, making graphene electrons behave just like a hot gas. "The heat is distributed evenly over all electrons. And the rise in electronic temperature, caused by the passing currents, in turn has a strong effect on the electrical conduction of graphene" explains Professor Mischa Bonn, Director at the MPI-P. The study, entitled "Thermodynamic picture of ultrafast charge transport in graphene", has recently been published in Nature Communications. Graphene - a single sheet of carbon atoms - is known to be a very good electrical conductor. As a result, graphene finds a multitude of applications in modern nanoelectronics. They range from highly efficient detectors for optical and wireless communications to transistors operating at very high speeds. A constantly increasing demand for telecommunication bandwidth requires an ever faster operation of electronic devices, pushing their response times to be as short as a picosecond. "The results of this study will help improve the performance of graphene-based nanoelectronic devices such as ultra-high speed transistors and photodetectors" says Professor Dmitry Turchinovich, who led the research at the MPI-P. In particular they show the way for breaking the terahertz operation speed barrier - i.e. one thousand billions of oscillations per second - for graphene transistors.